Rustic wood Mother's Day Sign,Grandparent Gift, Mimi Sign...The only thing better than having you as my MOM is my children having you as their MIMI. This sign is made from wood and burlap...measures 10" x 10" x 3/4". The sign is painted cream and distressed for a rustic time worn look. 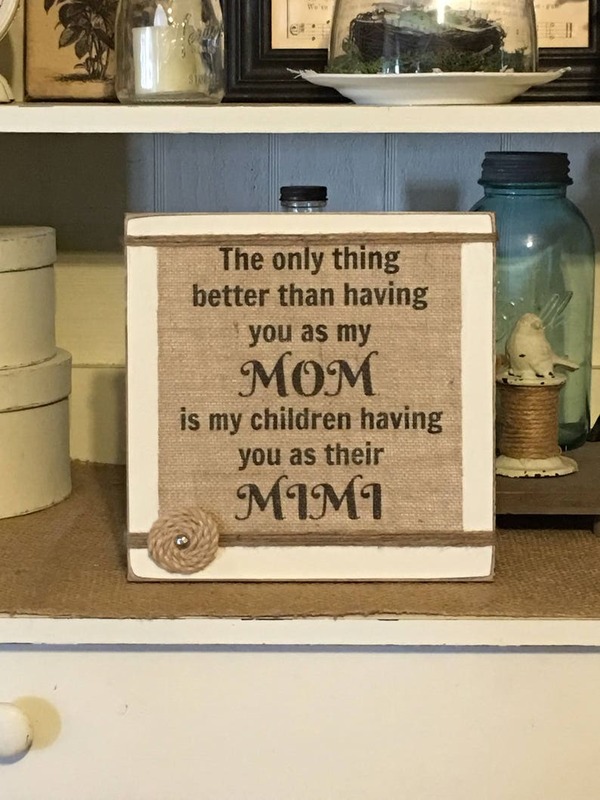 The Mom quote is printed onto burlap and attached to the front of the sign with strong adhesive. I also wrapped twine around the sign and also added a flower, which is made from twine. The back of the sign is finished in black and is ready to hang with attached wire hanger. Please choose color of sign and if you need Mimi changed to Nanny, etc, please choose when placing order. Handcrafted by Daisy Patch Primitives. Sign is made upon receipt of order, please allow 1-2 weeks for delivery. Inspirational Wood Sign,Burlap Sign,Plaque,When God Made You He Said, Ta Da! This item came out perfectly!! My mum loved it!